I really appreciate you going over this and bringing your Ghave expertise to the table. I'm definitely hearing you with Mikaeus, the Unhallowed and the ETB/recursion ability. He's a fantastic option for upping the effectiveness of the deck especially considering cmc's and tutors. For example, I could sack Protean Hulk to bring in Ob Nixilis, Unshackled, then after Protean Hulk is brought back, sack him again for Avatar of Growth. Ob Nixilis and Avatar they are both 6cmc, so fit in Protean's limitations! I could do the same with Fierce Empath though he just puts them into my hand. With Mikaeus on the battlefield and Eldritch Evolution or Birthing Pod in place, I could sac either Ob Nixilis or Avatar to bring the other in. Btw...Mikaus with Fertilid and enough mana for activate his search engine trigger? ohhhh man, match made in heaven! Ultimately, Mikaeus, the Unhallowed becomes another node in the network the gives multiple new routes to the goal - that's what I need in this deck, so thanks for that! I've seen the Karmic Guide + Reveillark mentioned often and see them ringing alarm bells for people when they are played. Someone's obviously getting up to something at that point! I'm going to play test them, but may keep them on the "maybe" for the sake of trying alternate routes out first. You are so very right though, the recursion package is going to be a big key to this deck hitting a rhythm. I know I'll end up trying them in here, but I'm going to dig for alternatives for now. ... even without those two in here though, Saffi Eriksdotter seems like a great add. I put together a rough version of the deck, set to private, just to play test it. I was missing having early drops that offer value and support to the machine while helping it move forward. Saffri could potentially be one of those. As for other recursion options: what do you think of Meren of Clan Nel Toth + Skullwinder (who also deters attacks) and/or Eternal Witness? I'm thinking this could be a good alternative for bring back Pir's Whim or another way to get Field of Ruin back. 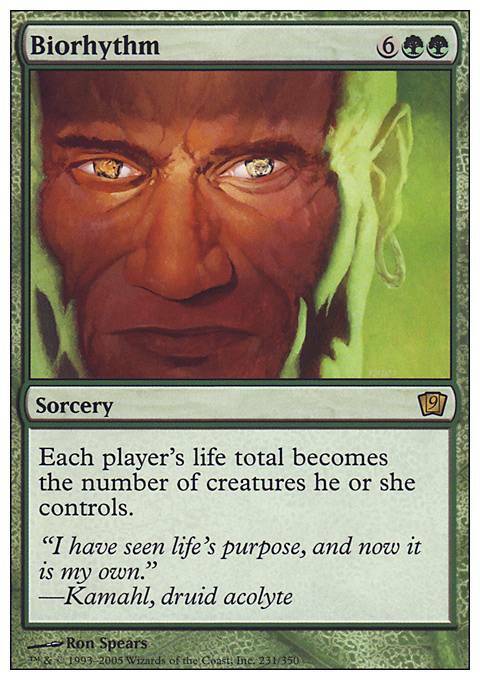 Meren would also get that Avatar of Growth ETB again in a turn - getting up to 6 experience counters with Ghave would be no problem at all. 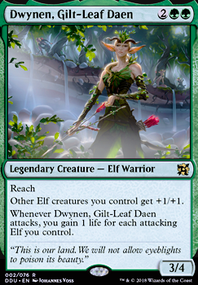 Also - one that has worked really well in play testing, because of the lands matters aspect, is Emeria Shepherd. She's amazing recursion actually. With all the great land spells I have that can drop larger amounts of land on the battlefield, I can bring in multiple plains at once to return creatures Avatar of Growth, enchantments (Pattern of Rebirth or Wound Reflection), or artifacts Ashnod's Altar back to the battlefield together for a final boom. Ghave initially made sense with the built in sac engine for Pattern of Rebirth, for fueling fertilid, utilizing the counters Ob Nixilis got, as well as his colours. I also knew that he had such great value engines because the second EDH deck I ever built was Ghave (with many of the combos) and I figured, once it was time to start filling the deck out, I know I have helpful options available. It's started to make more and more sense though as things have progressed. 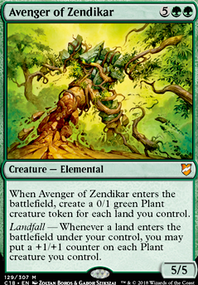 For example: If I get into the landfall token creation I'm producing good fuel for the sac engines like Ashnod's Altar, food for Skullclamp and triggers for Bloodspore Thrinax or Ivy Lane Denizen type engines and Mentor of the Meek. Great point on the infinite sacs for infinite flying demon, I didn't even make that obvious connection with Ghave's infinites and his trigger... And let's not forget, he's got trample! So, unless they are blocking with a flying, first strike deathtoucher, that's game for that opponent. I foresee the deck being able to combo off killing all but one opponent in some instances, so having the secondary "death-con" built into the primary is pretty nice. What I love about going the land-matters route is bringing in Ob Nixilis, the Fallen and taking the "pain" theme further with his landfall trigger. 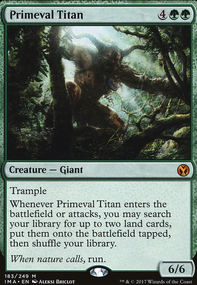 I could bring in mass lands from the big "search engine" ramp, token triggers to fuel ghave/altar/clamp/thrinax/mentor, then deal direct damage and grow a monster (unfortunately non-flying/non-trample). I do see the value in keeping some control in mind as well and am open to ideas for priorities there. Finding the balance will be the journey, for sure. Yet! his abilities and colours are pretty fun enablers and I have a few other ideas for him (though this is the jankiest of them so far). I'm excited to see this keep evolving, and with something that feels so unique in some ways, it's been pretty fun having folks like you step up with new insights that seem to take it to such a greater level. 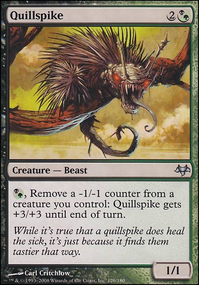 Another example is Hi_diddly_ho_neighbor's idea of Biorhythm... Something I don't think I've seen in a Ghave deck, yet Ghave can use it so well, and it brings everyone within easy reach of a Field of Ruin + Ob Nixilis, Unshackled search to death! Including Biorhythm and Shaman of Forgotten Ways is brilliant! Not only if I work the landfall token creature control, but as you say - to get everyone else within reach of an Search-kill. So good! Thanks muchly for this - it's the type of simple and small card additions that can bring it all together. I had Tempt with Discovery on the "Temptations" list—it half inspired the category's title even— but after some thought and seeing the other cards that were similar I decided to remove it. I think people are going to catch on so quickly and so it wont hold the value that the cards New Frontiers or Collective Voyage do. 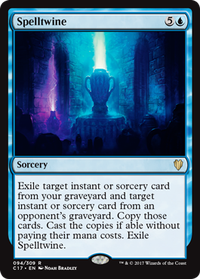 By the time everyone knows what's going on, the two mentioned will be huge value for me either way, while Tempt with Discovery will digress into a 4 cost tutor for 1 land. The only time I'd see it working is if I can cheat out Ob Nixilis, Unshackled on people who haven't played against the deck before. While City of Solitude would hold back a bunch of the trickery that other cards in this deck want to do, Dragonlord Dromoka and Grand Abolisher could be great potential additions. Grand Abolisher especially. What value! This is absolutely amazing! Such a off the wall and cool strategy. One card I might suggest is Tempt with Discovery, very rarely does someone not take you up on the offer. Also, if you are allowed one banned card in your deck, why not run Biorhythm (and its unbanned ilk Shaman of Forgotten Ways)? Usually no one will have more than 10 creatures on the board. Then you can drop their life total down to < 10 and make them search! You might also consider Grand Abolisher, Dragonlord Dromoka, or City of Solitude over a card like Silence. Rithier Punish them by running Biorhythm, definitely a game ending spell since you will guarantee have more creatures than them. Gifts Ungiven is also another card that definitely should be run as having four choices is pretty dumb. I like to drain life with my Meren. I use Jarad, Golgari Lich Lord with some bigger dudes. I also use Gray Merchant of Asphodel who gets a little out of control with Panharmonicon. And because Biorhythm is banned in commander I like Shaman of Forgotten Ways for a hilarious finish once the board is mine. If you're playing against a lifegain deck make sure to include useful cards like Torgaar, Famine Incarnate and Tree of Perdition. Nobody resets life like . Oh! Also, I notice you don't have Entreat the Angels. That is necessary in a token based deck. You could substitute that for Biorhythm since that is banned in EDH anyways.